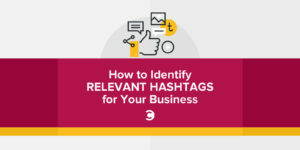 Identifying the right hashtags is critical when it comes to social monitoring and engagement. This allows us to find the conversations where our target audience hangs out. By adding value to the conversation, we can start to build up a relationship that could possibly leads to a business transaction (or at the very least awareness). I have developed this three-step method using a few favorite Twitter tools – Twitonomy, Hashtagify.me, and RiteTag. Assuming I am brand new to the niche, I may not have any idea what the hashtags might look like. However, I might know who are the key players within that niche (aka influencers). Let’s take my account for example. After entering my Twitter handle intoTwitonomy, I get an analysis of the hashtags I’m using. Repeat this with other accounts to get a bigger starter list of hashtags. Next, I head over to Hashtagify.me. After entering the hashtags I got from my starter list, I can locate related hashtags. It’s important to note that the size of the circle shows how popular the hashtags are, while the distance between inquired and related hashtags shows the extent of correlation. At this stage, do not be too concerned about these two factors. As long as it the hashtag is logically related to your niche, include it in your latest hashtag list. Finally, I visit Rite Tag created by Saul Fleischman. Under “Associated Hashtags”, I enter the hashtags that I had collected earlier. The result will show the related hashtags, along with color coding. The different colors represent the tweet density. Blue means ‘Poor’, Green means ‘Good’, and Red means ‘Overused’. Using the screenshot below: #Linkedin is an appropriate hashtag to use as it would give my tweets good exposure. On the other hand, #SocialMedia is overused as the tweet density is too high. This would result in my tweets getting lost in a tsunami of other #SocialMedia tweets. Another great feature about RiteTag is that it compares the hashtag to other hashtags, the tweets that the hashtags are used and the influencers who use that particular hashtag – very handy! Now, What Do I Do With a List of Hashtags? Create some streams on Hootsuite that include hashtags. Remember that each stream can include a maximum of three keywords. By monitoring the stream, I can start to see who are the frequent users of that particular hashtag and start to build a connection. This could be through favoriting their tweets, retweeting them, or even having a chat about the niche topic. These can also help establish a meaningful follower-ship. I hope these Twitter tools allow you to identify and build engaging relationships within your online community. It is critical to select appropriate keywords as some Twitter accounts may spam a particular hashtag with irrelevant content. Do you have other methods of locating Twitter hashtags that matter? Let me know in the comments! Editor’s Note: A version of this post originally appeared on HengBinTeo.com. Bin Teo is the digital strategist at Social Star - Empowering individuals to attract opportunities via digital brand marketing. He also volunteers at Mindful in May, a campaign that educate people on benefits of meditation, while bringing clean water to developing countries. Always learning and love to connect. Come say "Hi" at @itsBinTeo and drop by his blog.